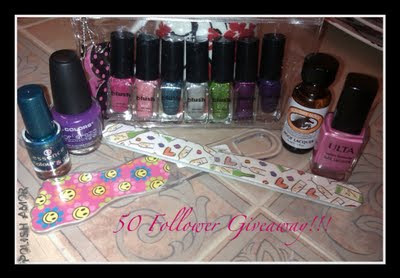 My giveaway ends this weekend..... Hurry and enter if you haven't there is still some time left.. GOOD LUCK to everybody!!! Oh I forgot to mention in my original post, the winner will be picked using Random.org!!! ALSO... Im trying to make a few changes to my page, trying to add Tabs, but I havent been successful, Im pretty sure its simple but I keep finding the hardest ways to do it, if anybody would be so kind to give me some pointers I would really appreciate it!!! I'd like to add tabs on ours but don't know how to do it either. Ooh I can help with the the tabs thing. I had a lot of difficulty with it too. Here's what you do: Get to the "New Post" page. Right under the "Posting" tab, it'll say New Post, Edit Posts, and Edit Pages. Click on Edit Pages and then click New Page. Voila! That page will be your new tab. You can add up to ten. I hope this helps! Laura.... THANK YOU SOOOOO MUCH :) got it it worked!!! this is so much easier than everything i found online, I hate messing with HTML codes..